Finally, we sleep in …again, but this time is different. It is the first time we have slept in on a hiking day, and probably the last. The temperature outside has dropped significantly. It is brrrr-cold. We heat water and sip coffee in the comfort of our tent and sleeping bags. We pack up and head toward the beer that surely awaits us. The trek out of Stehekin was easier than we had thought, and although we would want to probably take the ferry back to visit it, a walk in from Rainy Pass would not be that bad either. We consider its name’s translation, “Passing Through”, and its significance for those on the PCT, as it is for most, the “last stop” one passes through before reaching ones final destination. 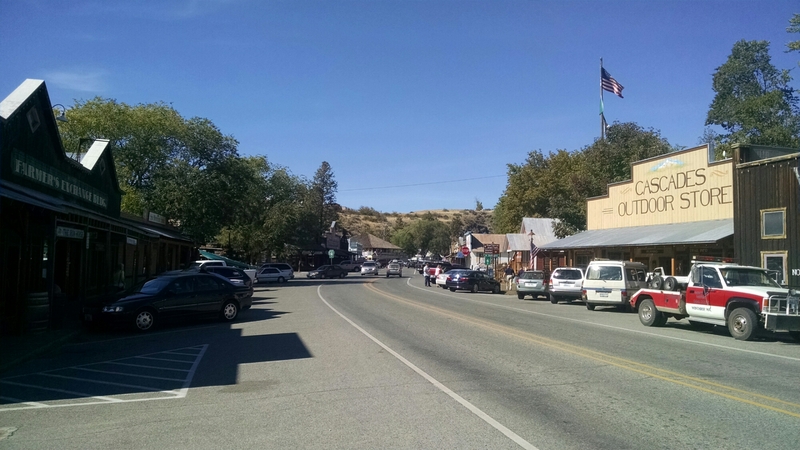 Early on in this adventure, and when I was off trail with my back spasms, Paul met , by chance or more likely divine intervention, a couple from Winthrop similar to our ages, while in Idyllwild. 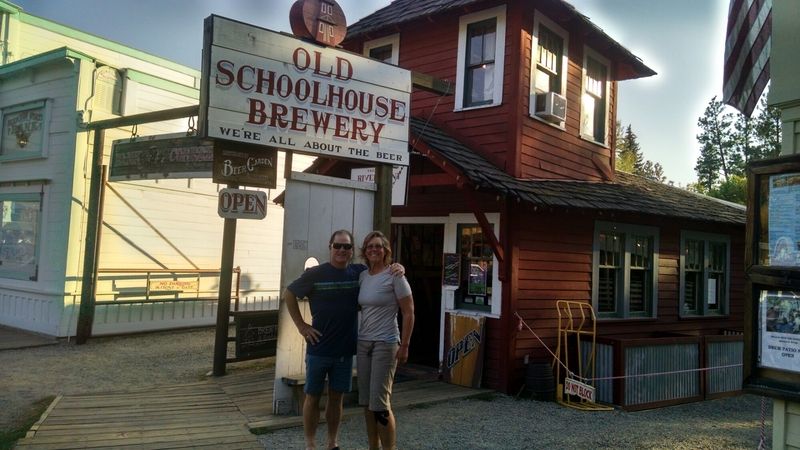 They got to talking about the trail and invited us to look them up when we get to Rainy Pass and they would treat us to beers at the Schoolhouse Brewery in Winthrop. At the time we had no idea where Rainy Pass was, let alone Winthrop. The offer however never escaped our minds and as we closed in ever closer to the end of the trail. It dangled before us like a carrot on a stick and spurred us on over terrain that was less than pleasant. Thus, we will make one more stop before we reach Canada. It is our understanding that we will meet Vicky at the parking lot at Rainy Pass. 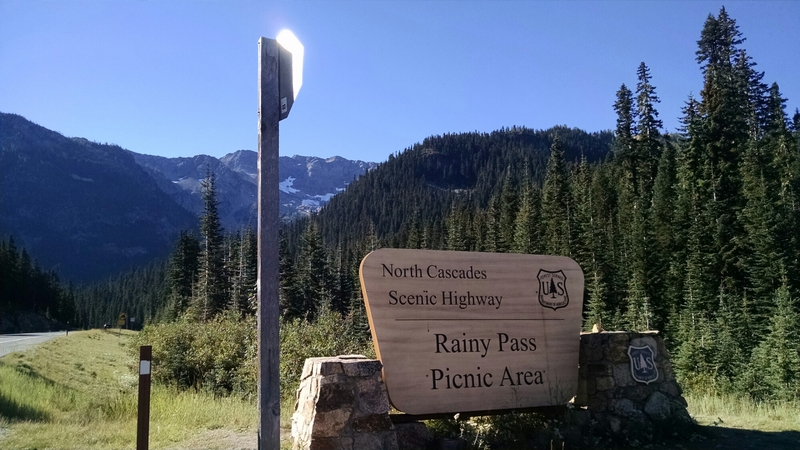 We did not know there are two Rainy Pass parking places in which to access the trail both of which are two miles apart. We reach a trail marker and find a freshly placed crate of apricots. Trail magic!! Two gentlemen come from what we think is a spur trail off Hwy 20, and ask us if the trail and direction we just came from will take them to Stiletto Peak. Just because we have backpacks on, does not mean we know the area or more importantly know where we in relation to other trails beyond the PCT, we want to tell them. We reckon that the Stiletto Spur trail which was offered as an alternate and part of the “old” PCT is what they are inquiring about. We tell them that the trail we came from will take them to the spur trail…and we assume Stiletto Peak. Figures, the one “old” PCT alternate trail we don’t take, someone asks us about it, and we have nothing to tell. We consider taking the spur trail from whence these two gentlemen came from to see if what kind of parking area they came from, thinking that maybe we can lop off 2miles and possibly intercept Vicky on her way to our rendezvous at Rainy Pass, but nix the idea, as we figure it would just be our luck to do so, and find that she was early and already waiting for us at the pass. Onward we stroll with the humming of the highway above us and to our right. We drop down into a culvert and then climb for a final approach to the pass. We peruse the day use parking area of Rainy Pass, in search of Vicky. She is not there, but we meet several day hikers, one of which shares his Trader Joe’s chocolate with us, and another older woman who is from Scotland and has friends who thru-hiked the PCT in 2006 and still talk about it. We walk back to highway and park ourselves next to the large fiberglass sign indicating Rainy Pass. Across the highway is another parking lot for Rainy Pass, and as it is nearing 11am, I decide to check out that parking lot to see if Vicky is there, while Paul “holds down the fort” at the Pass sign in case she drives up whilst I’m at the lot. While Vicky is not at this lot either, I discover that this is where we will start from tomorrow as it is the trail head for North bounders. It is well past 11am, but are not concerned, and in fact, are enjoying lazily basking in the sun as we recline against the base of the Pass sign. Several vehicle stop and ask us if we need a ride. We thank them and decline saying we have a ride coming. One vehicle offers us fresh nectarines, which we gladly accept and consume, moaning with delight savoring its juicy sweet flavor that we have sorely missed this summer. It is now nearing noon, and we begin to wonder if we are at the right place. There is no cell service here, so we can’t call or check messages. We begin to think that maybe we are in the wrong place. Maybe we are supposed to be at spur trail lot…figures…the one time a “short cut” would have been in our favor! We decide to divide and conquer. Paul will hike down the highway to the spur trail parking lot, and I will stay put at the sign. No sooner than 10 minutes after Paul sets out, another vehicle pulls up and asks, “Are you one of the hikers from California that is supposed to meet the lady with beer?”. Hmmm, sounds like us…and her. Ya, I reply tentatively, and ask if the woman’s name is Vicky. He replies that he didn’t catch her name, but offers me a ride to her location. I hop in with my gear. As Paul hasn’t yet reached the other lot, we pull over and load he hops in too. We pull into the lot and there is Brock drinking beer supplied by Vicky. We are greeted with screams of joy, laughter, hugs and slaps on the back. Do we want a beer?, Vicky asks. Silly question, why of course we do. She opens a cooler filled with 22oz bottles of Schoolhouse brewery signature beer. Nirvana. Brock apologizes for drinking what was to be “our beer”. ‘No worries’ we tell him as Vicky has brought enough for all, and has in fact been plying other hikers with beer as she waited for us. Turns out she had gotten here early, and if we would have taken the spur trail to this point we would have met up with her exiting that trail to the lot. This time we should have not overridden our temptation for “short cuts”. We catch up with Brock, laugh and tell stories. Meeting Vicky is like catching up with a long lost best friend. It is remarkable how much we have in common. We talk non-stop, and while her husband Larry is not here, as today is the deer season open for which we understand and frankly respect, Vicky and I conclude that Larry and Paul must be brothers from another mother, as they too, are alike, even down to their “bad” jokes. Soon the supply of beer is gone, and we are beginning to think we have somehow become “light weights” as we are, more than expected, feeling the effects of the tastey Schoolhouse beers. Turns out these beers have a wonderfully higher alcohol content, 7% by volume, compared to the other beers we have consumed on the trail (Coors, PBR, Rainier and the like). 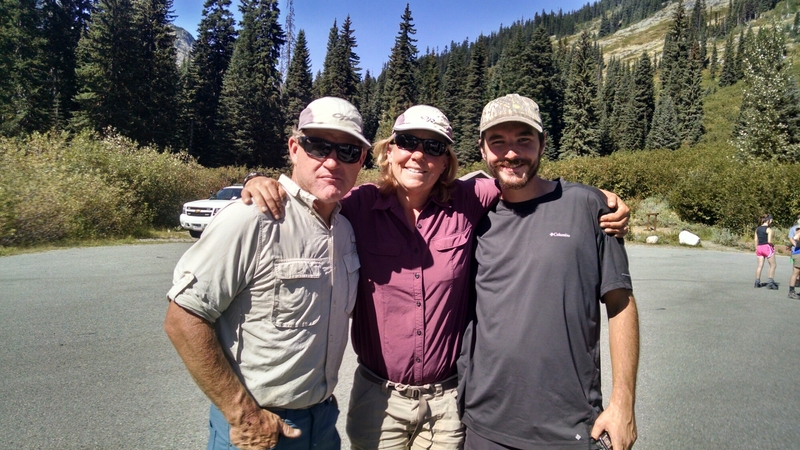 We say our goodbyes to Brock as he teeters off to the trail, and we load up into Vicky’s truck and make our way to Winthrop. As we drive, we jabber away incessantly. What a wonderful day, we are truly blessed. 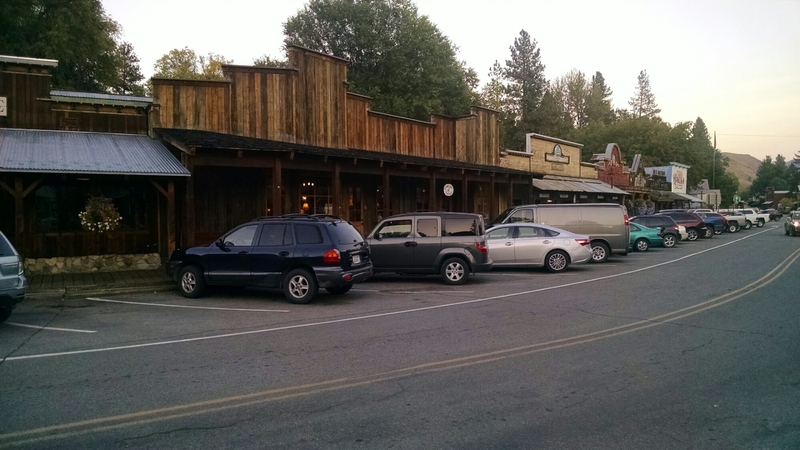 We arrive in Winthrop and discover a picturesque town whose storefront facades are punctuated by an “Old West” theme, down to raised wooden slat “sidewalks”. We duck into the “outfitters” for what will be our last canister of propane and a new headlamp for me. A stop at the grocery, we pick a few more snacks to supplement our final three days, then en route to Vicky and Larry’s house, of which we are told Larry designed and built. Cool! Along the way we spy hundreds of deer…smart deer, openly grazing in the recently plowed fields. Giant, trophy sized, bucks lounge in the fields as well, surveying their harems. This is exciting and torturous at the same time. We arrive at Vicky’s. Wow, what a place. It is warm and inviting. We peruse Larry’s trophy room. Nice. We’re jealous. Vicky asks us if we are hungry. We could eat, we tell her…always. Lunch is prepared, and we do our best not to scarf the sandwiches down like just rescued castaways. Conversation continues to flow freely, as if we’ve known each other forever. A glorious shower is followed by more conversation. We fill Vicky in on some salient details of our adventures that haven’t made the blog, either due to length of story or most likely content. More laughter ensues. 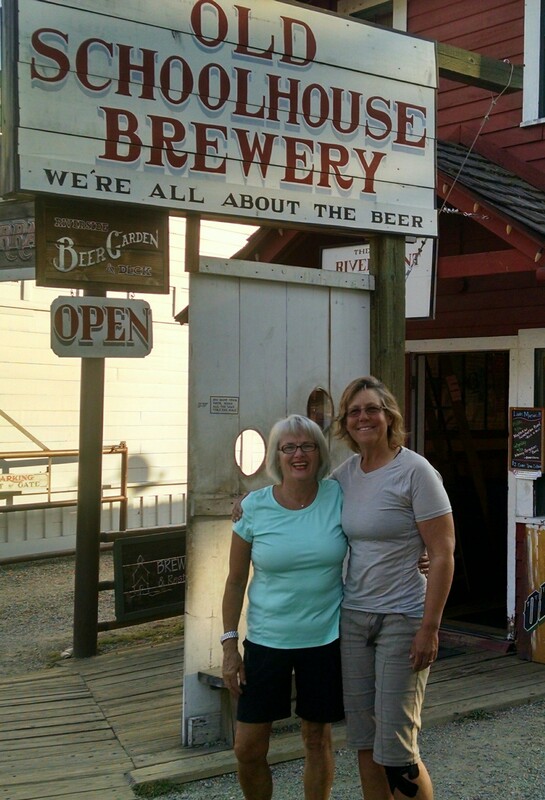 By now it is time for dinner and we dine at the Schoolhouse Brewery in town, Vicky’s treat. It is everything it was touted to be. Little do you know from the quaint storefront facade and cozy pub that there is a spacious open seating deck area than overlooks the tranquil river below. Dinner is followed by rich and creamy ice cream from the sweet shop down the street. We head back to Vicky’s to prep for tomorrow’s early morning departure for the remaining 68.9 miles which we plan to cover in three days, and thus finish what we started a little over five months ago.